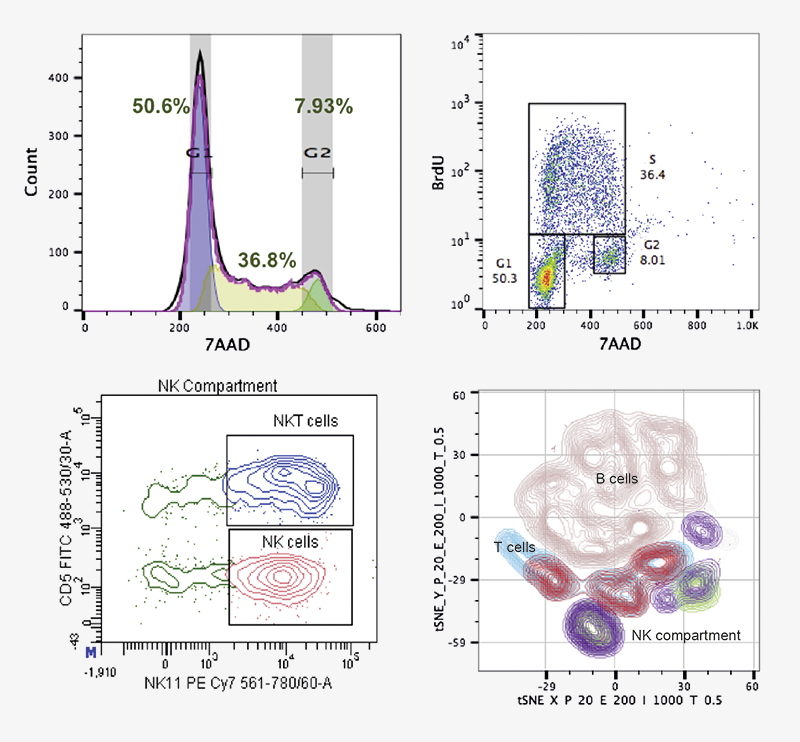 Flow cytometry is a technology that simultaneously measures and then analyzes multiple physical characteristics of single particles, usually cells, as they flow in a fluid stream through a beam of light. The properties measured include a particle’s relative size, relative granularity or internal complexity, and relative fluorescence intensity. These characteristics are determined using an optical-to-electronic coupling system that records how the cell or particle scatters incident laser light and emits fluorescence. 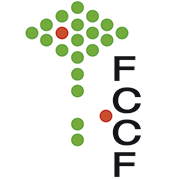 Flow cytometry has numerous applications in biology, immunology, pathology, marine science and plant biology. Equipped with 5 lasers, (355, 405,488, 561 and 640nm) the LSRFortessa is able to detect up to 18 colors simultaneously and delivers the optimal sensitivity and resolution required for multicolor applications. 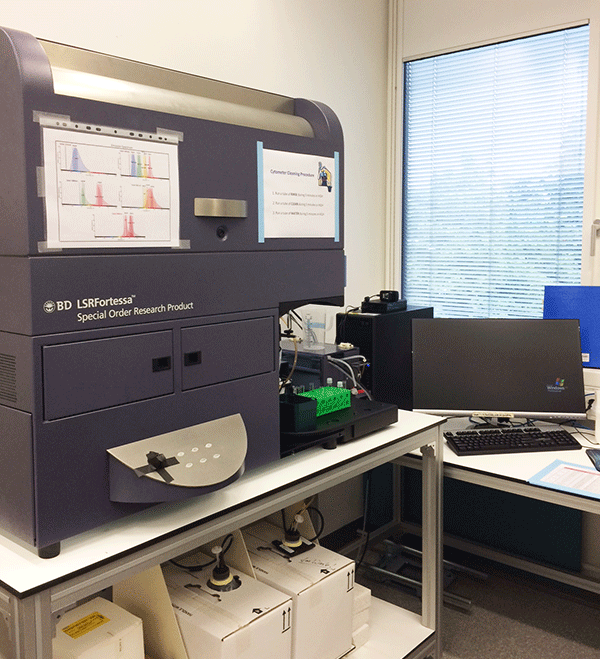 To improve experimental workflow, the facility has recently acquired the High Throughput Sampler (HTS) to offer rapid and fully automated sample acquisition from microtiter plates. 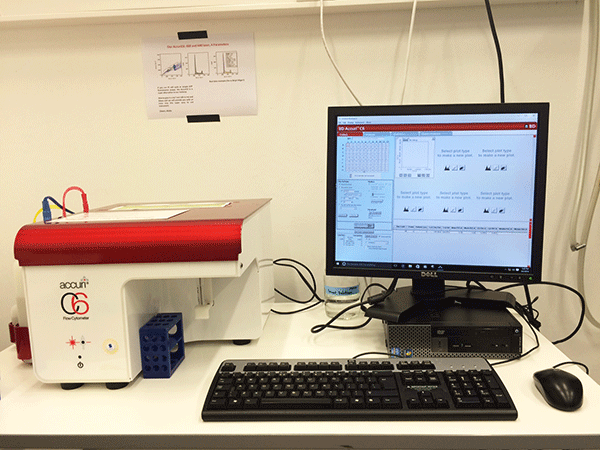 In high-throughput mode, the HTS option can speed through a 96-well plate in less than 15 minutes. The system is equipped with 488 and 640nm lasers, two light scatter detectors, and four fluorescence detectors. Optical filters are optimized for the detection of several fluorochromes, fluorescent proteins (GFP, YFP, mCherry, RFP) and DNA dyes such as propidium iodide and syber green. BD Accuri is a great option for quickly examine reporter gene transfection and measure cellular DNA content. Additionally, the instrument has the ability to accurately determine sample volume and automatically report concentrations for any identified population in a sample, without the addition of counting beads. The user-friendly Accuri software, allows novice users to acquire, analyze and display stats in a simple and faster manner. Give it a try you will be happily surprised!